Saturday September 23rd saw 12 stewards and interested people attending the training at the CWA District 9 office. We looked at the new California state law (AB119) which was added to the State budget and appeared in early July. This allows public sector unions to have a 30-minute period in the new employee orientation. We had been asked by the state labor federation and the lawyers who were working on this (including Weinberg, Roger, and Rosenfeld, our counsel) – to be careful not to trigger the law unless we were ready to meet its very tight timelines. We worked with the CWA materials and the ones that the Local has been sending to new hires and developed the outline of what we will provide to stewards who will be going to the orientations. We will be starting to attend sessions next week, with these materials in hand to invite new hires to join the union. Then we talked about CWA Strong and how the program can roll out to people who are working within the jurisdiction of CFI Local 39000. Since everyone pays the same dues – whether they join the union or not – we have not always been reaching out personally to the new hires to be sure that they join. Based upon challenges to the “union shop” in the public sector (this is a national challenge – either through Supreme Court cases or through legislation which is expected to start moving through the House of Representatives shortly) we could be at risk for losing the dues from those people. CWA is very aware of the challenges – having seen Michigan and West Virginia go “right-to-work” in the last few years. We know that organizing is the solution, and CFI needs to take advantage of the funding from TNG-CWA which has a SIF (Strategic Industry Fund) grant to help pay for leave for stewards to reach out and talk to these folks and invite them to become members of the local. We are almost at 100 registrations for the annual conference, and we still have space available. If you have been debating, please join us and register today – we need to print and produce materials and your registration confirms that number for us. We have added dinner on Saturday night, and a generous number of coffee breaks and other meals are included in your registration fee which is at 2014 rates! We look forward to seeing you at the Oakland Airport Hilton, there is a free hotel van from both the Oakland Airport and the Coliseum BART station. Parking at the hotel is reduced to $8 per day. Join your colleagues, hear great speakers, and maybe even have some fun! On Friday morning (9-22) (at 12:01 am) we closed out the electronic voting on the Region 2 contract with the result that members had voted to ratify. Mary Lou has advised the court of the ratification, and is working on when the wages will be effective. The management team was being difficult and legal counsel were being consulted. Region 1 bargaining team had a couple of Zoom (video conferencing) meetings last week in preparation for bargaining again today. Attorney Caren Senser continues to be our spokesperson, and the Committee will put out a bulletin after the bargaining session. It will be mailed to the members of Region 1 – but also placed on the local’s website so you can read it if you are not from that area of California. * WHY WEAR RED ON THURSDAYS? In 1989, CWA Local 1400 along with our union brothers and sisters in New York were on strike. One of the New York members from CWA Local 1103 walking the picket line was Chief Union Steward, E. Gerald Horgan. Eleven (11) years ago this August 15th, Gerry Horgan was killed from injuries he sustained when he was run down by a “scab” as he walked a picket line while striking for health care benefits. The driver of the vehicle which killed him was a manager’s daughter acting as a “scab” during the strike. As she approached the picket line, she accidentally accelerated her vehicle, and struck Gerry Horgan. He is the only CWA member in our 61-year history to be killed on a picket line. Typical of Gerry Horgan, the picket line he was on was not his own. The Members on another line needed some additional help and asked Gerry to provide that help. At the time of his death Gerry Horgan was only 34 years old. He was a dedicated family man, and very active in his community. He was the Chief of the Valley Cottage Volunteer Fire Department and a member of the Central Nyack Volunteer Fire Department. He developed, and was Team Leader of the Mountain Rescue Squad of Rockland County, New York. The Squad’s primary responsibility is for rescuing people who fall, or get trapped on the sheer cliffs of the Palisades. Gerry Horgan was also a Veteran of the United States Marine Corps. When Gerry was killed he left behind two children, Christine who was 2 & ½ and Danielle who was just 7 months. They are now coming of age where they can under- stand who their father was and what he stood for. We want them to know that their father’s sacrifice was not in vain and is still appreciated by the people he died fighting for. A journal is being put together in Gerry’s memory to be given to the girls. This journal will be a lasting reminder for them that their father, E. Gerald Horgan, was a trade unionist who is, and always will be, remember by his union brothers and sisters. So Why Red? Why Thursday? .....Thursday, because it is the day this tragedy occurred and red to symbolize the tragedy itself. Even though this tragedy occurred 12 years ago, the Queens New York Local still supports Gerry and his family! So as you look for something to wear next Thursday, show your support to your union and remember your fallen union brother in New York, and wear RED! WEARING RED ON THURSDAY isn't about showing disrespect for Managers or being anti-management. WEARING RED ON THURSDAY is about supporting the Union in the contract negotiation process. WEARING RED ON THURSDAY is having a voice in that process. WEARING RED ON THURSDAY is protecting your job and your wages from being reclassified into a lesser status. WEARING RED ON THURSDAY is saying the tuition reimbursement plan is important to you for your personal growth and development. WEARING RED ON THURSDAY is providing location security so you are not forced to move to another part of the country so the company can save a few dollars. WEARING RED ON THURSDAY is supporting families and working hours that are conducive to the family unit. WEARING RED ON THURSDAY isn't anti-management it is pro-community. It is having a strong contract so we can live together as management, service representatives and clerks without having to live in fear that one day our job will be replaced and eliminated. And it's about supporting your local economy. WEARING RED ON THURSDAY is being proactive during this process so we don't have to be reactive. showing it on the picket line! For all these reasons and more, support your local Union and yourself! WEAR RED ON THURSDAY ! The last day to get the discounted rate for the Oakland Airport Hilton is tomorrow – TUESDAY September 19th at 11:59pm. The rate jumps up (as folks noticed last week when the discount expired) due to the football weekend, and this is the longest extension we were able to get. You can still register for the CFI Conference (the price is rolled back to 2014 rates) and join co-workers and make new friends at the October 6-9 event in Oakland. The former officers of the Local entered into a contract that binds the Local to pay $58,000 (plus $14,500 in taxes) even if we don’t fill the rooms and event. Because we are bound to $37,500 in food and beverage expenses, we are upgrading the meals and adding a dinner (maybe 2!) and certainly a cocktail reception. The contract was signed based upon attendance of 300 – so far we have 79 confirmations for Saturday. The leaders of TNG committed to holding the event – and we are holding it, with great speakers and presentations. Please register and join us. Region 2 has reached a tentative agreement which is being voted on now by the members. We are using a new electronic system which adds additional security to voting, and results will be available later this week. Members of Region 2 will see their raises in their next payroll period if the contract is ratified. The agreement is a 3-year contract. More details are on the website. Note we took this opportunity to try out BallotPoint a group that we will be having run our officer elections when we hold them. So far, they have been very responsive. Region 3 – not a ratified contract but the Court has imposed a 1 year contract. This puts a contract in place, but there are questions about conflicts between the language and the law. Our legal counsel looking into what actions can be taken to protest the terms that are different. Bargaining will need to start preparing 6 months from now for what we hope will be more successful next time. Region 1 – next bargaining is scheduled for August 25th – we have heard that many (many!) people have asked for the day off to come and support the Bargaining Committee in the Watch and Support Committee! Please remember to wear red on Thursdays and bargaining days! We have a great lawyer bargaining with the elected committee, but it takes membership involvement and support to get the changes being sought! With the new law on orientation access in California that went into the July 1 State Budget, we have new access to interpreters as they are hired. Additionally, CWA Convention Delegates passed CWA Strong at the August Convention. Public Sector bargaining units are under challenge in the Federal Courts and we need to strengthen our membership numbers to prepare us for possible bad outcomes. This effort is applicable to all public sector workers represented around the country (over 100,000 strong) by CWA. Training is required for all Stewards, and recommended for anyone who is considering running for office in the elections which will begin soon. CWA District 9 has signed an agreement with Hernandez Strategies (the same lobbyist the Local had been paying). We are working with TNG and CWA District 9 to set our relationship back up, and in writing this time. Once we have more to report, we will let you know. SAN FRANCISCO (Sept. 12, 2017) _ Region 2 Courts and CFI reached a tentative agreement yesterday that the bargaining team is recommending for ratification. If ratified by the membership, the three-year contract will implement wage steps and a salary structure for interpreters for the first time in Region 2, and now also includes a wage reopener in July of 2019. The salary range has 5 steps with 5% between the steps, with existing employees entering into steps 2 and 3 depending on years of service. This will provide 21% in wage growth for all unit members by the end of the three-year term. The wage reopener in July of 2019 means that before the MOU expires, it will open and we will negotiate again on wages only. Rather than getting a COLA upfront, we will have the opportunity to bargain for a COLA less than 2 years into this contract. Improved language preserving our legal position and remedies related to the pension changes is also part of the agreement. The deal came toward the end of the day. The Region started the session by rejecting our counter proposal for an across the board COLA of 4%, and actually asked CFI to take back the very same offer members had just rejected, and to recommend it. They offered nothing to sweeten the deal, saying a majority of the Region’s CEO’s remained firmly against providing any economic improvement to the proposal that the members just rejected. They did not come to bargain to agreement, and the lead negotiator threatened again to withdraw the three-year deal and present a one-year offer without a salary range. The bargaining team introduced a number of options, including a wage reopener, to reach a settlement and secure the gains we’ve achieved over the past year. The Region wanted a clause preventing work actions during the wage reopener. We rejected that and the deal was struck when the Region dropped that demand and agreed to a full reopener that gives us the opportunity to pursue further wage improvements during the term of this contract. The Bargaining Committee is endorsing the deal because it guarantees wage growth, establishes wage steps for the first time in Region 2 and-- for the first time in the state-- it establishes a step range that's comparable to what the vast majority of court workers have always enjoyed. We did not want to risk that and put our membership or the public we serve through a longer battle given the Region’s entrenched position and an uncertain outcome. We are disappointed of course that a majority of R2 CEOs (and the judges who ultimately direct them) resist recognizing the pay inequities that have kept our wage growth so low. We are disappointed to see that court leaders aren’t motivated even by their own recruitment problems to make staff compensation more competitive in the labor market standards for our skills. This attitude is rooted in institutionalized discrimination based on gender and national origin. 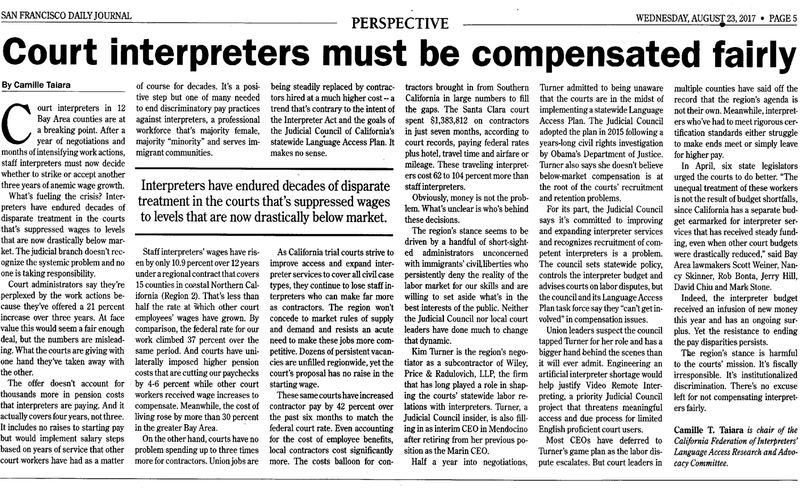 That’s a a bigger battle we’ll continue to fight together as a profession, to change the mindset that undervalues interpreters and get the judicial branch to accept and act on the facts: it takes a high level of skill and knowledge to make meaningful access a reality for LEP court users and anyone who relies on their testimony. It takes a workforce of highly qualified and fairly compensated professionals. Without true and accurate interpretation there can be no justice for all in California. Your Region 2 bargaining team believes getting all we could out of this round of bargaining, as we have, will strengthen us and increase our collective resolve to continue that fight. Details on voting will follow shortly. The bargaining committee plans to carry out the vote quickly, with our recommendation to accept, so that members will receive their pay increases as soon as possible if the deal is ratified. Session will take place at CWA District 9 Offices in Santa Fe Springs from 10am to 4pm – Lunch will be served. Session will take place in Bay Area. We are confirming a location in Oakland which is both near BART and has parking. 10am – 4pm – Lunch will be served. If you are interested in helping with new employee Orientation – this is the meeting/training for you. As of July, there is a new law in California giving unions access to new employees during their orientation. We have been asked by the lawyers and the State Federation of Labor to be careful about how we launch this orientation – since we don’t want to make bad precedents as the law is getting into effect. We would like to have stewards and others trained in every Region (and Court) to be able to reach out and welcome new employees and invite them into joining the union. We need to have your RSVP at least 72 hours in advance of the training to be able to print materials and order the food. *CWA STRONG is a challenge to all of us, to create a shared understanding of the forces that seek to derail the gains we’ve made. We’ll use the smarts we’ve acquired in decades of organizing, bargaining and mobilization to reach every member, strengthen our union and protect good jobs, wages, benefits and retirement. Remember we rolled back the rate to 2014 prices for registration. The vote on the Region's last offer has concluded and members voted to reject the courts’ proposal. Members met to discuss the proposal and voted in large numbers throughout the region, with 74% of eligible voters casting a ballot. This is a decisive outcome and the bargaining team has notified the Region and proposed dates for a return to the table. The moratorium on work actions ends September 11 in accordance with our agreement to put the Region’s proposal to a vote. The San Francisco Labor Council has granted our request for strike sanctions. Strike sanctions requests are also in progress from CWA and central labor councils around the Bay. Based on the progress we’ve made over the past year, and how close we are to a tentative agreement, we’re confident it is still possible to avert a strike by reaching a tentative agreement at the bargaining table if the Region's decision makers are interested in doing so. the lack of any increase to the entry level pay in the new wage scale. Both concerns can be addressed by increasing the bottom step or adding a COLA to the economic package. Our polling shows we are in a strong position for continuing our work actions. We appreciate the determination and support expressed by interpreters region wide regardless of how they voted. An editorial published in the Daily Journal last week as this vote was pending tells the full story about why we’re standing up and strongly united for a better deal.